The state's highest civil court has ruled that Laredo's ban on plastic bags violates state law. The Texas Supreme Court handed a loss to local government on Friday, striking down a Laredo ban on plastic bags. The decision imperils about a dozen other cities' bans across the state. The court’s ruling resolves a long-standing question over whether local governments may impose such bans, as cities including Austin, Fort Stockton and Port Aransas have in recent years. Friday’s unanimous holding makes those bans unenforceable as well and likely tosses the issue over to the Texas Legislature for debate. The court said in a unanimous holding that its intent was not to wade into the "roving, roiling debate over local control of public affairs" but simply to resolve the legal question at hand. "Both sides of the debate ... assert public-policy arguments raising economic, environmental, and uniformity concerns," Chief Justice Nathan Hecht wrote for the court. "We must take statutes as they are written, and the one before us is written quite clearly. Its limitation on local control encompasses the ordinance." The Laredo Merchants Association sued the city back in March 2015, arguing that the city’s ban on single-use bags conflicted with a state law regulating solid waste disposal. But the question stretches back even farther than that. In 2014, then-Attorney General Greg Abbott issued a nonbinding opinion advising that bag bans are legal if they are not aimed at “solid waste management.” That murky phrase, which appears in the Texas Health and Safety Code, has become the fulcrum for debate on the issue. The Laredo case, which made its way to the Texas Supreme Court in January, has focused on that semantic difference. 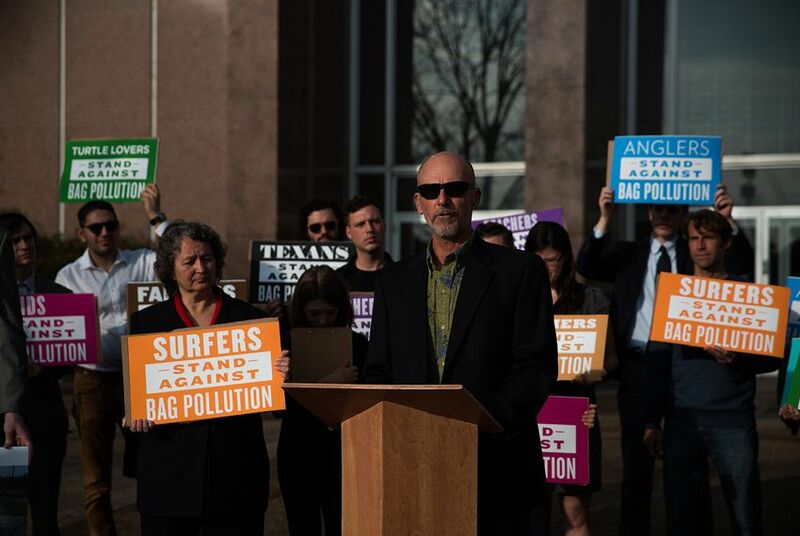 Lawyers for the city, led by former Texas Supreme Court Justice Dale Wainwright, argued that the bags are not garbage and are therefore are not covered by the relevant state law. Lawyers on the other side, who have been joined by the Texas Attorney General’s Office, argue that they are. Kelly Harragan, who wrote a brief on behalf of the Turtle Island Restoration Network, said the court may revoke cities’ bans, but businesses and consumers still have the power to aid the environment. Environmentalists urged stores to do just that. "Plastic pollution is harming wildlife, marring the beauty of our cities, and threatening our health, safety and economy. Nothing we use for five minutes should pollute our environment for hundreds of years," said Luke Metzger, executive director of the group Environment Texas. "We call on major retailers, like HEB and Walmart, to continue observing the ban in these cities and ask the Legislature to remove the preemption statute." Disclosure: HEB, Walmart and the Texas Municipal League have been financial supporters of The Texas Tribune, a nonprofit, nonpartisan news organization that is funded in part by donations from members, foundations and corporate sponsors. Financial supporters play no role in the Tribune's journalism. Find a complete list of them here.